OK, so you’re probably wondering why the blue sad faces are across the top of this site. And why only one yellow HAPPY face? 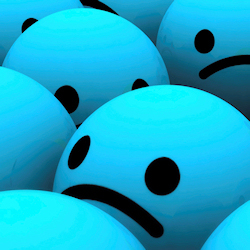 The blue sad faces are a metaphor for the fact that most business owners and managers waste a lot of time and money when it comes to using the Internet for marketing and advertising their businesses. As a result, they are not happy. The yellow face is one of my clients (or someone who reads my newsletter each week!). I figure about one in one hundred business owners or manager are unhappy with the results they are getting from their Internet marketing. They expected better, they’ve tried a lot of things, and nothing is working the way they want it to. And… they’re tired of throwing money at Internet marketing and seeing little return-on-investment. Practical Online Marketing is my attempt to change that. It’s my goal to help business owners and managers cut through all the hype, baloney, inaccurate and incomplete information on the Internet about online marketing – and make better decisions. One decision that will help you is subscribing to my Practical Online Marketing newsletter. Give it a try, it’s free, and if you don’t like what you read and you don’t find it valuable, there is a link at the bottom of each issue you can click and automatically be unsubscribed.